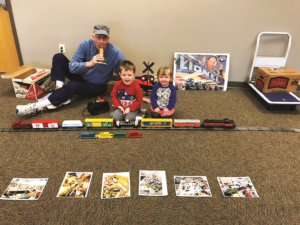 That’s what railroad enthusiast Paul Schoenike told about 25 youngsters and several adults during a story time presentation at the Brodhead public library last Wednesday. 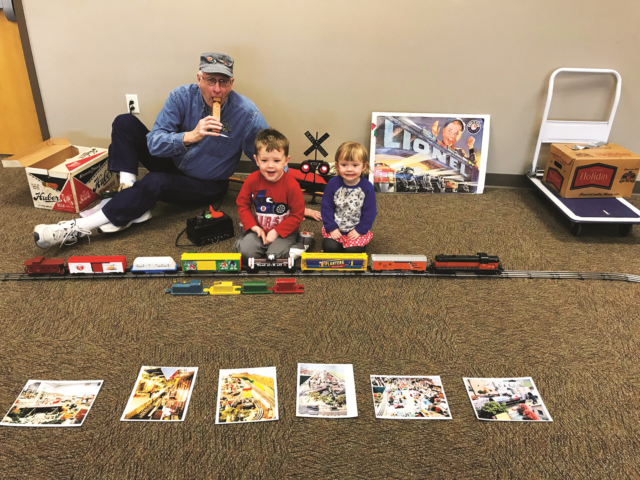 Youngsters watched as Schoenike pulled a half-dozen Lionel train cars out of a box and placed them on the train track he had set up on the floor in the public meeting room. As he did so he talked about each of the cars. A model train car that could carry cheese, one for M & Ms, another for peanuts, one for milk, and tank car for carrying liquid Tootsie Rolls were some things the kids could relate to. Of course, there had to be a red caboose at the end. Finally, out came the engine and Schoenike began running the whole train for the children. Pick up the April 17th print edition for the full story….